Nokia’s chief executive Stephen Elop, an ex Microsoft employee, tied Nokia exclusively with Windows Phone and while the Finns have finally gotten out of the red for the first time this Holiday quarter, it’s hard to say that Lumia Windows Phone sales have gotten traction. Actually, the opposite is true. Possibly, Elop is still bitter over Google’s decision to stop supporting Exchange ActiveSync accounts, a technology Windows Phone uses for push notifications for services like Gmail. Or he could be tacitly referring to something else altogether. 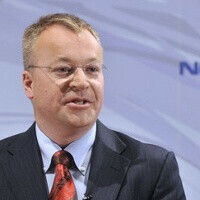 In either case, Elop is confident in Nokia without Android, and in Android getting more fragmented and closed. It’s up to you to agree or disagree with him. Are you ignorant? Sony, HTC and other DO TURN A PROFIT with android, if they didn't they would have cut ties already. It's funny that you bring up HTC, as they have made money the whole time, just not as much as they used to make. That's because of business decisions they have made, not because they use android. You sound like a fanboy with this kind of logic. Please read my comment to you below. HARDWARE MAKERS WANT TO SELL HARDWARE. THEREFORE THEY WILL/SHOULD SELL IT WITH WHAT EVER OS SELLS. That is an Unemotional statement. That is what business is about, making the most money with the least effort and time possible. HTC would be still making profit if they didn't f**k up their android reputation with the Thunderbolt and EVO. Yeah and it they would just make a cellphone that has the same title, design, and specs on all carrier then Moto, HTC, and LG would be as profitable as samsung. If Apple ever did ONE thing right, it was keep their products looking the same on at least 3 of the big four carriers in the U.S. Also Maybe all manufacturers should have an open mind in making WP and Android phones. This whole locking yourself up to only one type of OS is retarded! If Nokia would make that same great design that they have for these failing windows phones and slap android in it. id buy it in a second! Microsoft hates, and wants Linux dead, no wonder he's jealous! Nokia please wise up and come to android ............SOON! Nokia, please wise up and send Elop back to MS. Where he belongs. Of course he is saying this, he's just upset his company didn't get on board with android from the start. Right.. That must be it..
His mission destroy Nokia is on the wayyyyyyyyyyyyyyyyyy! How great would it be if people would use only statements they actually can confirm with statistics, demonstrations, polls or other kinds of more or less objective facts. Okay, you guys seem pretty confident... You guys try stepping up to his shoes for a week...you'll know what to do since you know everything. Agreed that he might a bit boiled up, but no one would like to see a company drop out of everything. Even if he did, there are other people that can vote him out. So, unless you know for sure...shut it.